long-standing support for Earl Shilton in Bloom with a donation towards planted flowers for this year’s display. The 2017 theme for Earl Shilton in Bloom will reflect the 50th anniversary of the ‘Summer of Love’, with a range of vibrant and colourful flowers displayed in a mix of ornamental and handmade planters, some of which will be artistically enhanced with a ‘Flower Power’ motif. The display will be pieced together with the help of over 20 volunteers from the local community. Mary Statham, of Earl Shilton in Bloom, said, “It is great to be working alongside Earl Shilton Building Society once gain. Our sponsors and donors from the local community help make Earl Shilton in Bloom what it is – we couldn’t do it without them and we’re very grateful for their support. “To receive a Silver Gilt Award last year was a real honour and we are hoping to at least match the points score that we achieved last year, but above all else, our aim is to enhance the local environment for the benefit of those who live or work in Earl Shilton. Paul Tilley, Chief Executive of Earl Shilton Building Society, added: “We are passionate supporters of Earl Shilton in Bloom and what they are trying to achieve. Each year the display transforms the town and we are excited by the plans for this year’s display. It will be wonderful to see such an abundance of colour. Earl Shilton in Bloom’s entry was commended for a third successive year in 2016. The award-winning design centred on a theme of ‘turning grey spaces green’ and the Society helped to fund self-watering hanging baskets used for the display. Memorable themes in previous years include 2014’s design, incorporating poppies and a giant army boot, to mark 100 years since the outbreak of the First World War. 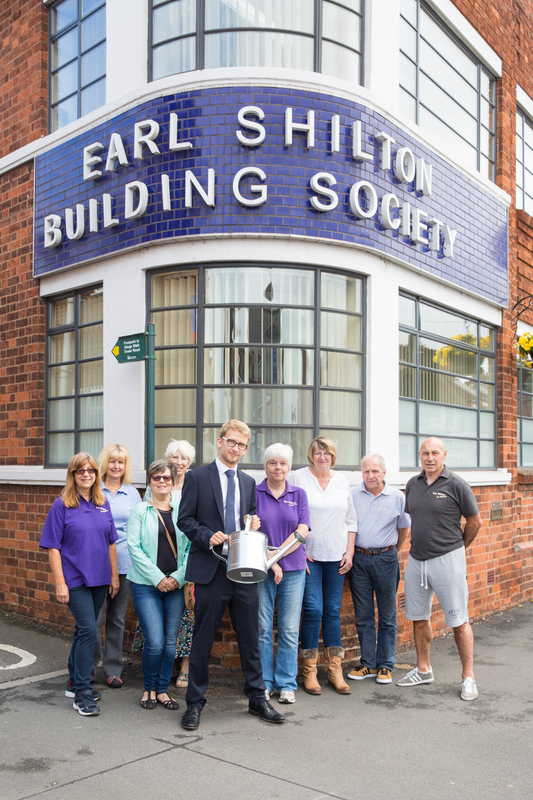 Earl Shilton Building Society offers donations to local good causes through its ‘In the Community’ fund. Any local group in the Earl Shilton and Barwell areas interested in taking advantage of the fund can apply via the Society’s website. Requests will be reviewed regularly with a decision made on individual merits and funding availability. All types of community groups, charitable organisations, teams, clubs and schools can take part. However, to ensure the scheme remains truly local, applications will only be accepted from the following postcode areas, LE, CV9 to 13 and DE11 to 15.